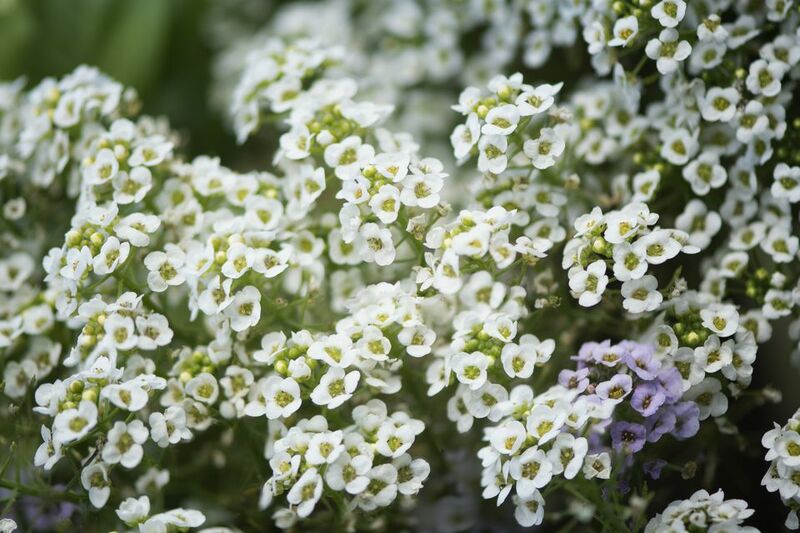 Sweet Alyssum is a delicate carpet of tiny flowers with a subtle, sweet scent. The low-growing foliage is covered by flowers for much of the growing season. Sweet Alyssum is very easy to grow, from plant or seed. It is a cool season flower that can be set out in early spring. In frost-free climates, Sweet Alyssum can also be grown throughout the fall and winter. Most varieties will fade in the heat but bloom again in the fall. Plant Type: Sweet Alyssum is an annual plant, although some varieties are hardy in frost-free areas. Sun Exposure: Sweet Alyssum plants will grow in either full sun or partial shade. They appreciate some shade during the hottest part of the day. Bloom Time: Flowers typically bloom from June through October. Some plants may continue growing all year long. Flower Color: Tiny cross-shaped, 4 petal flowers in white, pale pink and purple, clustered in rounded racemes. The leaves are narrow, lance-shaped, slightly hairy gray-green leaves. Hardiness Zones: Gardeners in USDA Hardiness Zones 7–11 may have plants that continue growing all year long. Sweet Alyssum is a nearly unmatched plant that is hardy to both heat and drought. It thrives in a wide range of regions across the United States. The flowers have a sweet, lively fragrance and are members of the mustard family. They will self-sow and can provide year after year of bright color, especially in milder climates. Sweet Alyssum loves full sun, but it does not like prolonged dry periods. If your region is especially hot and dry, a slightly shaded area will work best for this plant. Take note of times of hot and dry weather, as the plant will need extra water. The plant prefers loamy soil and when grown in gardens, it is usually as a ground cover. In natural settings, it is commonly found on sandy beaches and dunes. Alyssum can also grow on cultivated fields, walls, slopes, and even in cracks in sidewalks or walls. To water the plant, provide at least an inch of water every week. Provide more water during hot or dry spells. Make sure the water drains well, otherwise the plant is susceptible to rot. In temperate weather, gardeners may have plants that continue growing all year long, but they will be short-lived. Sometimes they self-seed so much that is seems as if the same plants are surviving when in reality, new seedlings are filling in. Sweet Alyssum plants repeat bloom, although many varieties tend to stop flowering in heat. In-ground Sweet Alyssum plants should not need any fertilizer unless your soil is poor. Container alyssum plants will need more frequent water and monthly feedings. Use a water-soluble fertilizer for the container plants. You can start Sweet Alyssum from seed or plant, although some new cultivars are not available as seed. Seedlings are widely available in nurseries, in the spring and often in the fall. To start Sweet Alyssum from seed, simply scatter the seed and press it down, so that it makes good contact with the soil, but it is still exposed to light. Keep the soil moist, until germination. Then water whenever the soil feels dry. You can direct seed outdoors, once the soil feels warm to the touch. You can also start alyssum seed indoors, about 8 weeks before your last frost date. Do not transplant until after all danger of frost. Alyssum is somewhat frost tolerant, once established, but tender transplants are not hardy enough for frost. Deadheading will keep the plants flowering. If you have a large drift of plants, shearing them by 1/3 would be an easier option than deadheading. They will set new buds quickly. Some varieties will readily re-seed themselves, but the plants tend to revert to the somewhat gangly species. Man of the newer hybrids, like Snow Princess, are sterile, but they have improved vigor and stand up to the heat better than those that put a lot of energy into setting seed. Sweet Alyssum is a low grower that makes a wonderful carpet-like ground cover. As the plants spread, they will create a living mulch under taller plants. You can use Sweet Alyssum along edges, in the garden, or to fill nooks and crannies on walkways and walls. If you plant it near stone or anywhere that dries out quickly, you will need to provide some extra water. The tight, free-flowering plants are also great in hanging baskets and containers. Sweet Alyssum is generally problem free. Aphids can become a pest, especially when the plants are under stress. The plants will do poorly in boggy soil or where drainage is a particular problem. It can get stem rot or leaf blight, especially when too much shade prevents the leaves and soil from completely drying out. Botrytis blight is also a known problem when the Alyssum grows in extremely wet areas.